Since the concept of “environmental security” first gained traction in the early 1990s, research on the issue has been overwhelmingly focused on how environmental change impacts state security. That has been to the detriment of policymakers trying to preempt instability and conflict, according to the University of Toronto’s Tom Deligiannis in his article, “The Evolution of Environment-Conflict Research: Toward a Livelihood Framework,” published in February’s Global Environmental Politics. Rather than focus on how environmental change affects security on a state level, Deligiannis argues, researchers should instead turn to “development practitioners, population-environment researchers, and climate change adaptation researchers,” whom he credits with bringing household-livelihood analysis into the mainstream. By taking a livelihoods approach to environmental security, Deligiannis bridges the gap between environment-conflict research and human security research, elevating the individual dimension of environmental security in ways that state-based analysis overlooks. Through a livelihoods framework, scholars and policymakers can build adaptation and mitigation strategies that address climate-driven instability at its roots – in the households and communities whose resilience forms the first line of defense against instability transitioning into conflict. Even as he emphasizes the scarcity-livelihood-conflict link, Deligiannis makes it clear that a precise path from scarcity to conflict is difficult to map out. The path can be straightforward, with scarcities provoking a security dilemma between communities trying to secure access to dwindling resources which, quoting earlier work done by Colin Kahl, “can set off an action-reaction spiral that leaves all parties worse off and less secure.” Alternatively, a community might adapt successfully to one scarcity, only to provoke “unanticipated negative social effects” that ignite conflict far afield – either “geographically or temporally” – from the community initially impacted. This scenario is already playing out in the Sahel, where changes in underlying environmental trends have made it difficult for the traditional coping mechanisms of both pastoralists and farmers to co-exist. To reduce this risk of unintended consequences, Deligiannis argues it’s important to prioritize low-risk strategies and offer vulnerable communities access to more and varied types of coping and adaptation mechanisms. The message to researchers is clearer: “Ultimately, environment-conflict research should do more than diagnose how and why environmental and demographic change contributes to conflict,” he writes. “It should offer scholars and policymakers insights into what interventions would be most effective at mitigating the negative social effects of scarcities.” To do that, Deligiannis argues that more work should focus on the specific, local-level systems of the most vulnerable, as opposed to state-level analysis. “Such an approach will also lead to a better appreciation of the many previously-ignored local violent conflicts that have their roots in human environmental change interactions,” he concludes. 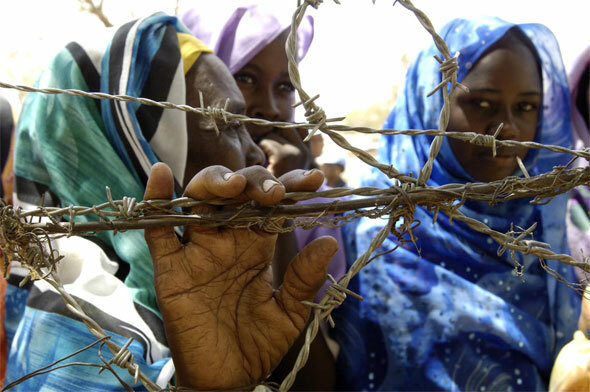 Photo Credit: “Displaced Sudanese, El Fasher,” courtesy of United Nations Photo. I want to thank the NSB for the chance to highlight my work, and I hope that this stimulates an interesting discussion about my paper. However, in reading the posting above, I would like to make one small clarification. I don't think that I agree with this statement in paragraph 3: " Deligiannis’ path to the livelihoods framework begins with resource scarcity, which he singles out as the key environmental factor that can spark conflict on a subnational level." This sentence makes is sound like my paper is making a statement about causal strength around scarcities – that they're causally strongest in explaining how sub-national violent conflict happens. However,I never say this. In fact, the livelihood framework precisely argues that you have to look at the entire asset portfolio to understand how people cope and adapt, and whether these outcomes can help contribute to social or violent conflict in local areas. Resource scarcity may be important or it may not be important. It depends on the other assets available to a household. Decision making within households depends upon a range of factors and influences, and the diagram in my article highlights the range of natural, social, economic, and political factors that can impact how households adapt or cope. Certainly, natural asset factors matter, and that shouldn't be a surprise in places where a large part of someone's livelihood stems from their ability to exploit their natural assets. So, in my own research, patterns of change on the natural asset base, patterns over many decades, were important in understanding, along with other causes, why people chose to adapt to stresses on their natural asset base in a particular way – in a way that contributed to violent social conflict. However, it's far too deterministic and simplistic to focus on natural assets as key given the wide range of additional factors that also had a role and impact.. In terms of a causal argument, my approach is consistent with an approach to causality that Homer-Dixon argued in his 1999 book, and that I've argued with Dan Schwartz and Tad Homer-Dixon in the 2001 Gleditsch/Diehl book. It's a multi-causal, interactive explanation of causality that sees natural resource assets as an INUS factor – one factor among a set of factors (or causes) that help explain particular outcomes. Again, I want to thank the NSB for their great work! Thanks for the feedback, I updated the post to reflect your comment.